The Easter holidays have begun and the sun is shining (just about!). Time for adventures, chocolate + egg hunts galore. You can find some more ideas for day out activities to wear out the kids in my last blog - Top 5 Places to Explore this Weekend. 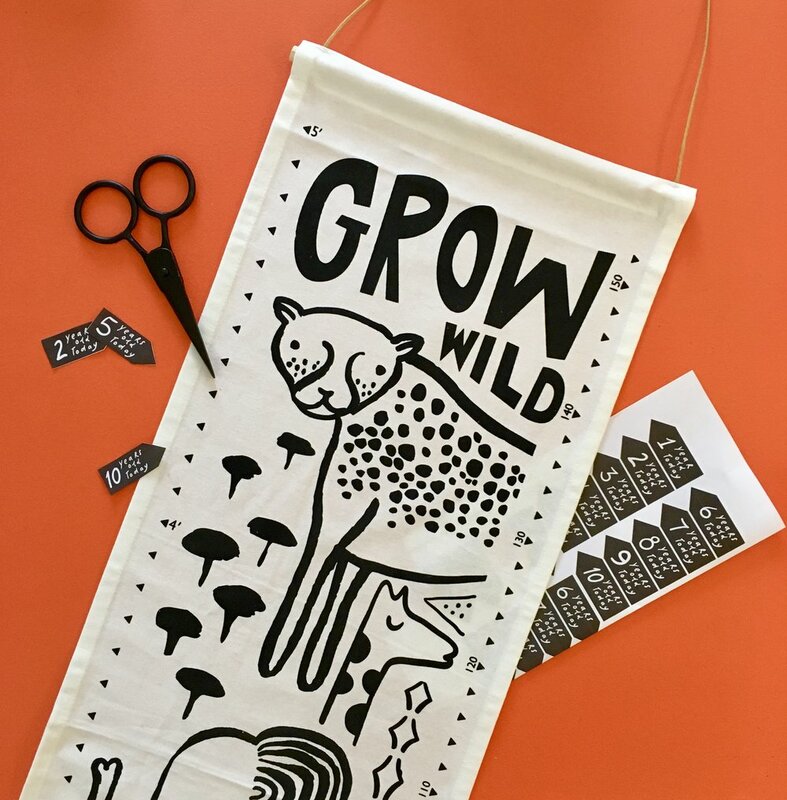 Chart your small people as they grow, with these Safari and Woodland Canvas Growth Charts by Wee Gallery. These monochrome hangings are screen printed on organic cotton canvas, and finished with a leather hanging cord and stylish fringe end - perfect for making nurseries and playrooms even more fun. Download these cute little Growth Chart Markers to print and attach to your chart at each birthday and see just how much they have shot up! For something a bit more practical, these hardwearing paper storage bags are super durable, and can be used for all sorts of things. Excellent for storing soft toys and comfort blankets, you could also use them as laundry or waste paper bags (like I do at home!) to keep playrooms and little bedrooms spick and span. The black and white Paper Bags come in Stripes, Grid or Confetti patterns, and measure 53cm x 34cm x 11cm (the edges can be turned over to the desired height). These adorable little clip on ears are great for Easter, or any time at all! Jazz up Easter outfits and dress up as a bunny, mouse or cat with these felt embroidered ears on silver hair clips. And not to forget the Easter Bunny herself! Just Dutch’s hand crocheted Miffy comes in all sorts of coloured overalls, but I particularly love the simple black and white ones. Hope this gives you some alternative ideas for Easter treats. Hope you all enjoy the Easter holidays and good luck entertaining the little ones!